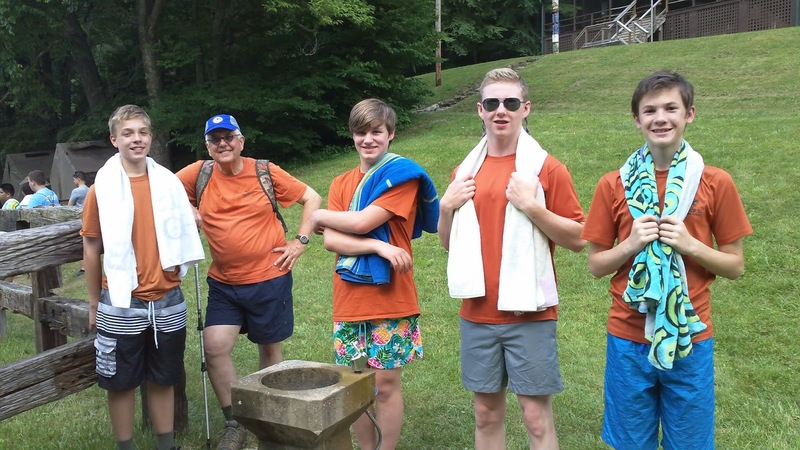 The Zip and Splash contingent of Troop 50 is enjoying another aspect of the Camp Daniel Boone program. Nick, Joe, Trey, and Hunter are part of this adventure program along with Mr. Williams and the scoutmaster. 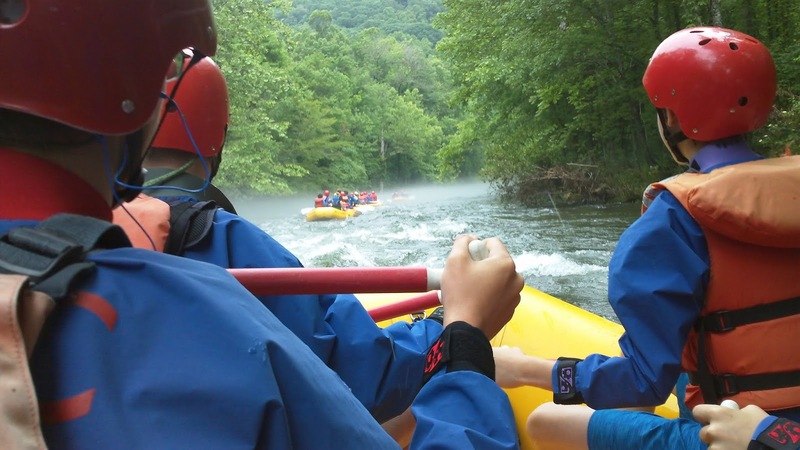 The schedule for the week includes three days of rafting on the Nantahala, French Broad, and Pigeon Rivers along with two days of zip lining at the Nantahala Outdoor Center. We are staying at the Harrison Adventure Base, which is about a mile outside the front gate of Camp Daniel Boone. The Harrison Base has tents and a bathhouse for our use and, as an added bonus, a washer and dryer. We eat our meals in the Dining Hall at Daniel Boone for breakfast and dinner and our lunch is eaten at the site of the programs for each day. Awaiting the start of the swim test in the 50 degree waters of Lake Allen. Mr. Stanford has already mentioned the lack of efficiency with the check-in procedure, which also hampered our program as well. The most common answer given by staff members when questions were posed was, "I don't know." However, we eventually made it through the day and were able to pass a comfortable night despite a black bear wandering through the campsite in the night. This morning we were on the road to the Nantahala River by 7:30 and were ready to raft by 10:00. Following the obligatory safety briefing and life jacket/helmet fitting, we boarded the bus for the put in point. The name Nantahala comes from the Cherokee language and is translated to mean "land of the noon day sun." Because the river runs through a steep valley, the sun does not really warm the river. Additionally, the water is released from the base of a dam, which means the water is even colder. Our swim test in Lake Allen seemed warm in comparison. The warmer air above the river left a cloud of vapor hanging in the air as we began our trip down the river. The float trip was mostly uneventful despite the relative youth of our raft guide, Andrew. He graduated from high school only three weeks ago and we were the first group he had guided on the river without the help of an instructor. He was very knowledgable however, and gave us a great ride through the rapids. We asked him what would happen if someone had an "out of boat experience" and he told us that no one had ever fallen out of a raft with him. 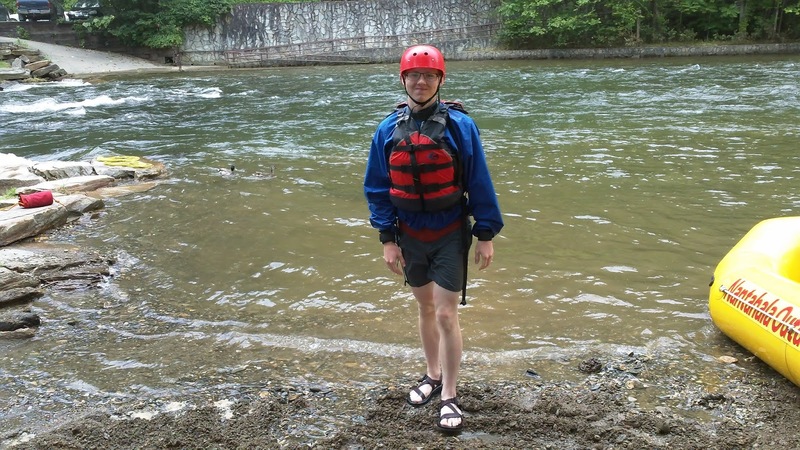 As if to test his abilities, Nick went over the side as we headed through the class III rapid at Nantahala Falls. Andrew responded well to the challenge of rescuing Nick but he seemed to forget he was also steering the raft and we made several 360s and bumped across several rocks before Nick was unceremoniously hauled back into the boat dripping wet. Following a dose of dry clothing and lunch beside the take out point, we loaded back into the camp vans and returned to the Harrison Base. Tomorrow we will be back at the Nantahala to test ourselves against the adventure course in the trees above the river. I hope to provide more photos from today and tomorrow once I am able to get a phone signal. The finicky WiFi at Daniel Boone makes it quite difficult to upload many photos and the camp is outside the range of cellular coverage. Hopefully, I can post those pictures while we are out tomorrow.